Whether you own a home or business, there’s a lot going on under the surface of your property. A wide range of utilities, including electric, water, gas, cable and more, run lines and pipes underground. In addition, you or former property owners may have hidden things underground, such as sprinkler systems, fuel tanks or septic systems. Before embarking on any project that requires digging, do your due diligence. In Massachusetts and throughout New England, start by calling 8-1-1 for Dig Safe®. This nonprofit organization will notify the utility providers in your area, who will respond by coming to your property and marking the location of their underground utilities. Calling Dig Safe isn’t only just a good idea; it’s the law. If you are hiring a contractor to do the work, they will likely make the call, but be sure to confirm with them. In Massachusetts, Dig Safe will notify gas, electric, telephone, cable television and private water companies who are regulated by the MA Department of Public Utilities. 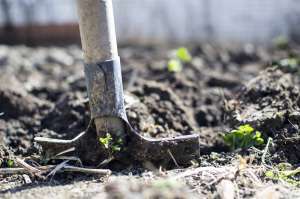 You must allow a minimum of 72 hours (not including weekends and holidays) before you begin your digging project), and you have to pre-mark the area where the work will take place. More information is available on the digsafe.com website. In addition, you should verify you have the insurance coverage you need in the event someone is injured or your property is damaged during a digging project. Make sure your homeowners or business property insurance provides the coverage you need, and if there are any stipulations you must meet. Even after calling Dig Safe, it’s important to proceed with caution for any digging project. You may encounter other hazards that aren’t overseen by public utility companies, including landscape wiring, cables for pools and spas, pipes for sprinkler systems and more. Digging poses dangers to the digger, the property and potentially the greater community. If you damage a line, you are required to report it to the appropriate utility company. If there is the possibility of a threat to the health and safety of the community, call 9-1-1. Learn more about how to dig safe in this award-winning video. Need to check your coverage? Contact us today.